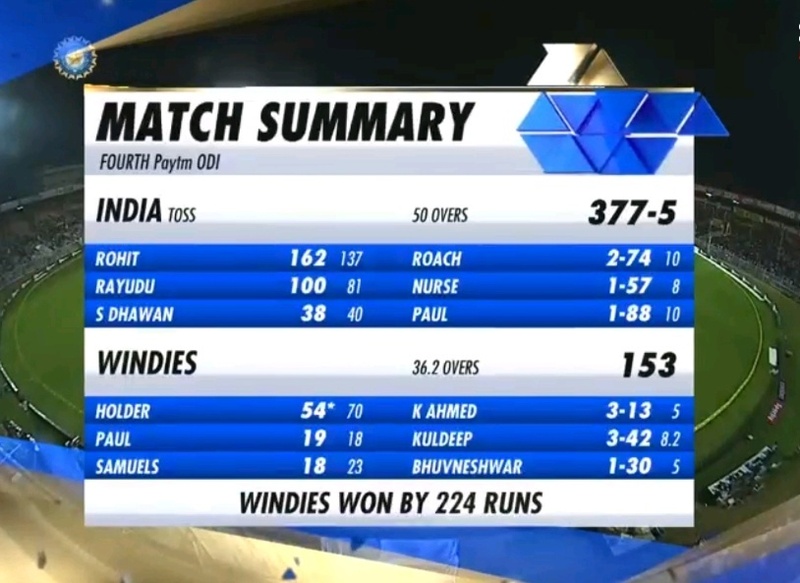 India defeated West Indies by 224 runs in the 4th one-dayer played at the Brabourne Cricket Stadium, Mumbai on Monday. India batted first and posted a huge target of 378 runs in front of West Indies. The Caribbean team broke up in front of this huge Target and lost the match by 153 runs in 36.2 overs and India a took an unbeatable 2-1 lead in the five-match series. Rohit Sharma & Ambati Rayudu contributed heavily to India's huge victory. 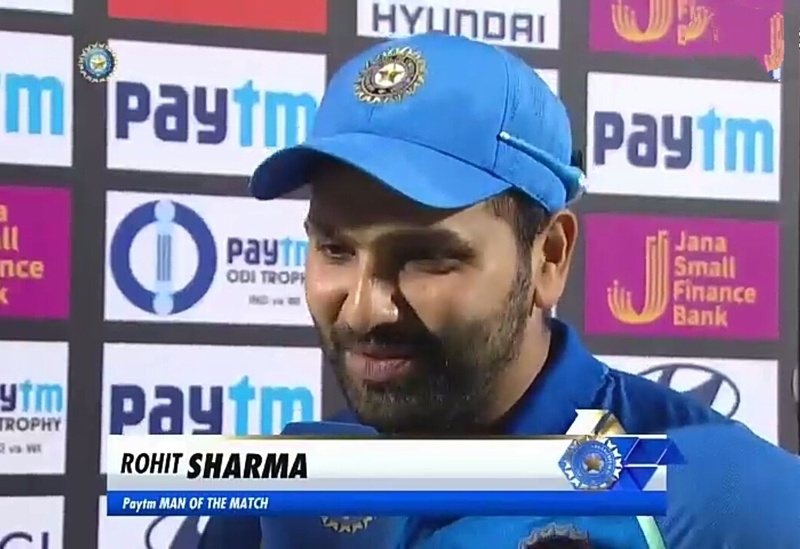 Rohit scored 162 runs in 137 balls with 20 fours and four sixes. On the other hand, Rayudu scored 100 in 81 balls Both Rohit and Rayadu shared a 211-run partnership for third wicket. 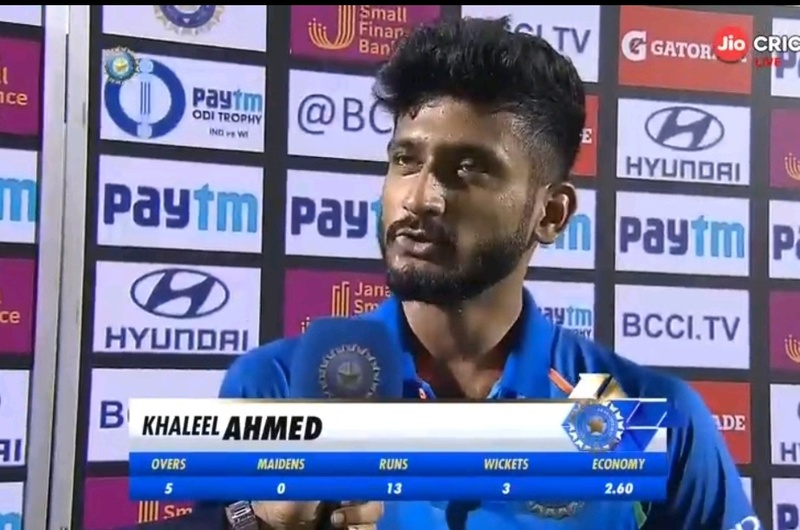 After the stellar performance by Rohit and Rayudu with the bat, Khaleel Ahmed stealed the show with his amazing swing bowling as he picked 3 wickets for just 13 runs in his 5 overs. This victory is India 3rd biggest win against West Indies and any Test playing country. However, India biggest win came against Bermuda in March 2007 by 257 runs in Port of Spain and Hong Kong by 256 runs in Karachi in June 2008. 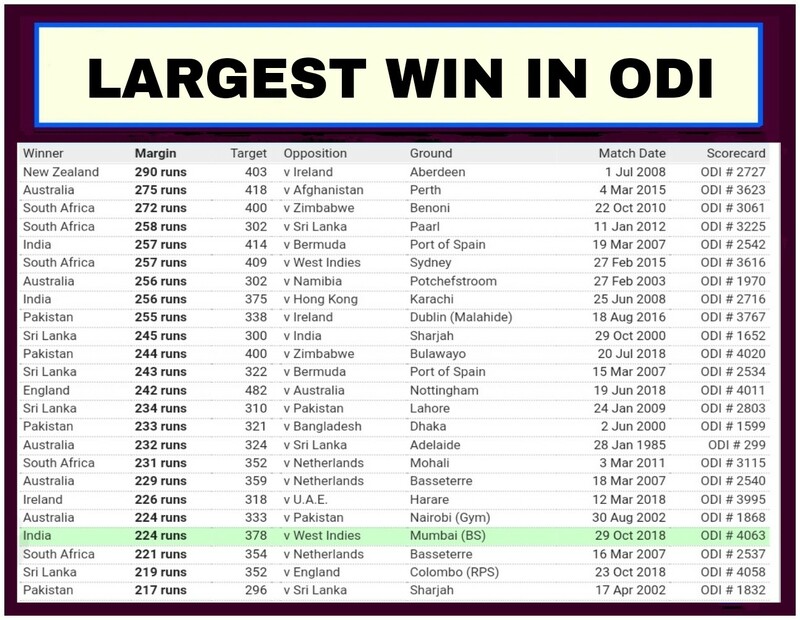 Team India successfully broke the record of Pakistan's 4th biggest win in ODI history. Pakistan defeated Sri Lanka by 217 runs in 2002 in the ODI match played at Sharjah.